C.J. Redwine: Vacation Day Two: In Which C.J. Discovers The True Meaning of The Word "Putrescence"
Vacation Day Two: In Which C.J. Discovers The True Meaning of The Word "Putrescence"
1. We spent the night in a nice little hotel about 20 miles from Holiday World. 2. We drove to the hotel at night but even in the dark, the town seemed charming. Quiet. 4. In the morning, we woke up, got ready, opened our ground-level room's door, looked directly across the street and saw that our charming little hotel was parked smack dab in front of the county jail. 5. A jail with a gaggle of motorcycles clustered out front--proof that a gang of hardened criminals were currently visiting one of their nefarious cohorts and probably planning their next assault upon humanity. 6. I didn't get too worked up about it, though, because a closer examination showed that instead of Harley's, they were those silly little Honda scooters. 7. What kind of respectable bike gang rides scooters? 8. Retired Riot? Geriatric Gang-bangers? 4:00 Buffet or Bust? 9. We returned to Holiday World to hit our favorite rides again, and everything was going well until three un-related facts collided to cause one major moment in my life. 10. Fact One: I decided to stay with the Scientist while my hubby took Daredevil and Starshine to make their hourly contribution to the local restroom. 11. Fact Two: We decided to forgo sitting on a bench like normal people and thought it would be better to hike up a grassy area to stand in the shade of a tree--despite the fact that the tree was also the preferred hangout zone for various insect of the flying variety. 12. Fact Three: My mouth is rarely closed. 13. I stood there, in the shade, talking to the Scientist about one thing or another, waiting for the return of the rest of the family. 14. The Scientist asked me a question. 15. I opened my mouth to answer. 16. A ladybug flew straight into my teeth. 17. Straight into my teeth. 18. My somewhat tardy self-preservation instincts kicked in the second that bug hit my front teeth and I clamped my lips down around the lower half of its body, thereby ensuring it did not finish it's suicidal charge down the back of my throat. 19. 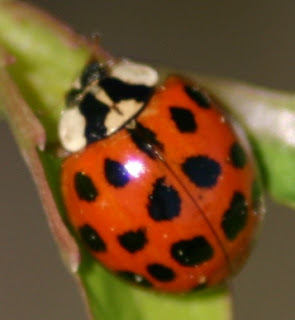 You might not know this--I certainly didn't--but ladybugs are equipped with a horribly nasty no-good very bad something they excrete when they feel threatened. 20. That horribly nasty no-good very bad something coated my lips in the .03 milliseconds it took for my brain to scream the "Spit it out!" command and my mouth to obey. 21. The ladybug hit the ground, fluttered it's wings a bit, and went on about it's dastardly business. 22. I was left gagging and spitting, trying unsuccessfully to rid my mouth of the horribly nasty no-good very bad something that tasted (I discovered when my tongue, showing a dismaying lack of good sense, flicked over my lips) like a combination of jalapeno peppers, motor oil, and Lysol. 23. The Scientist (also showing a dismaying lack of good sense) was laughing himself breathless rather than doing something useful like fetching me a free Pepsi, a napkin, or, at the very least, offering to find a Brillo pad I could use to scrub my lips from my face. 24. When Clint and the boys returned from the bathroom, the Scientist wasted no time telling them of my misadventure. 26. Clint would've joined them had I not threatened to kiss him within an inch of his life. Leave it to you, CJ, to give me a whole new perspective on ladybugs--along with a laugh. One of these days I want to go on a vacation with you...your vacations are NEVER boring! Florida is only for those who want to commit a suicide involving bugs of the mosquito and beetle type. In elementary school, during P.E., a beetle flew into my teeth. It just bounced off, but I had to shake my head and make an unpleasant face to get over the initial shock of it. Then in seventh grade, a beetle (must have it out for me or somethin', caught to many of their kind in Animal Crossing) flew down the gap between my glasses and my eye. Unpleasant face. Ah, finally a story to outdo the tree swing banana feeding.